WELCOME TO THE OBAGI-C® RX SYSTEM OF SKIN CARE PRODUCTS! Complete skin care regimen formulated with 4% hydroquinone to reduce hyperpigmentation and other essential ingredients to help address the signs of skin aging caused by photoaging. Please read this product information prior to use of the Obagi-C® Rx System. Any questions regarding your particular skin care regimen should be directed to your physician. More information about the Obagi-C® Rx System or other Obagi systems is available at our website at www.obagi.com. 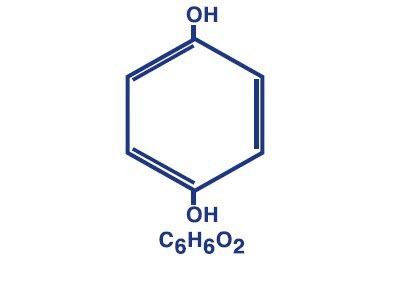 Topical application of hydroquinone produces a reversible depigmentation of the skin by inhibition of the enzymatic oxidation of tyrosine to 3, 4-dihydroxyphenylalanine (DOPA) and suppression of other melanocyte metabolic processes. Exposure to sunlight or ultraviolet light will cause repigmentation of the bleached areas, which may be prevented by the use of sunscreen agents contained in the Obagi-C® Rx System Sun Shield Matte Broad Spectrum SPF 50. A thin application should be applied once or twice daily or as directed by a physician. If no improvement is seen after three (3) months of treatment, use of this product should be discontinued. Sun exposure should be limited by using a sunscreen agent or protective clothing to cover bleached skin when using and after using this product in order to prevent darkening from reoccurring. • Hydroquinone is a skin-bleaching agent, which may produce unwanted cosmetic effects if not used as directed. The physician should be familiar with the contents of this insert before prescribing or dispensing this product. • Test for skin sensitivity before using by applying a small amount to an unbroken patch of skin and check within 24 hours. Minor redness is not a contraindication, but where there is itching or vesicle formation or excessive inflammatory response, the product should be discontinued and a physician consulted. Close patient supervision is recommended. • Avoid contact with eyes, nose, mouth, and lips. In case of accidental contact, the patient should rinse thoroughly with water and contact a physician. • Sunscreen use is an essential aspect of hydroquinone therapy because even minimal sunlight exposure sustains melanocytic activity. 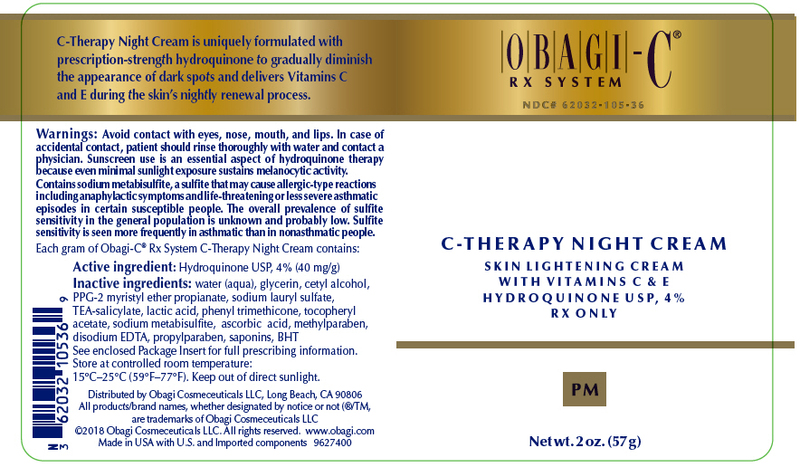 The Obagi-C®Rx System C-Therapy Night Cream contains sodium metabisulfite, a sulfite that may cause allergic-type reactions including anaphylactic symptoms and life-threatening or less severe asthmatic episodes in certain susceptible people. The overall prevalence of sulfite sensitivity in the general population is unknown and probably low. Sulfite sensitivity is seen more frequently in asthmatic than in nonasthmatic people. Store at controlled room temperature: 15° to 25°C (59° to 77°F). Keep out of direct sunlight. Obagi-C is a trademark of Valeant Pharmaceuticals International, Inc. or its affiliates.